The law is a constantly changing entity; sometimes those changes are minor, and other times those changes can completely alter the way an area of law operates. As an industry professional, one must always ensure that any updates made to our area of practice are both brought to our immediate attention and strictly adhered to. In the last 18 months, property and conveyancing lawyers have been hit with a number of changes to their field. Some of these changes have simply been procedural, with no great material effect on the actual law and its application. Other changes however, will revolutionise property law and the way in which we practice in this area. 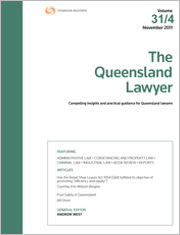 For the PDF version of the table of contents, click here: Qld Lawyer Vol 36 No 1 Contents.